By now most of you know that I am a vegetarian. I eat eggs and dairy, but no fish or other meats, and I’ve been consistent with this for nearly fifteen years. When I traveled to India, we had 20 people on our program, with more than half (perhaps more like 3/4) of us vegetarian. It was the first time in my life I was in a group where the veggies were in the majority. It was also the first time I was in a place where I could walk into any restaurant and be guaranteed several vegetarian meal choices, or could have my choice of several completely vegetarian restaurants all within walking distance. It was both liberating and overwhelming. Making the food transition was one of the hardest parts of returning to the US at the completion of the program. I really missed the South Asian ease of finding vegetarian food (looking for grocery products with a green dot on the packaging to ensure it was animal product free), and was sad to see my restaurant choices relatively limited once again. Since our student group had a veggie majority, the few meat eaters were suddenly finding themselves in the uncharted territory of feeling similar to how vegetarians sometimes feel in the not-always-vegetarian-friendly US. When our program cohort went out to dinner we would order more vegetarian dishes to share than meat dishes, and the meat eaters had fewer options. Sometimes only vegetarian food was ordered, since the meat eaters liked the veggie dishes too. Yet transitioning from eating meat every day to once in a while was too much for one student. Now, I get that. I don’t think anyone should be forced to do something that they don’t feel comfortable with, but no one was forcing him to give up meat. It was just on occasions when the whole group had dinner together that it was easier to order more/all vegetarian meals. Plus Bob liked the vegetarian dishes too, so it wasn’t like we were forcing him to eat something he didn’t like. But the student continued to insist that he was being discriminated against, and that eating all these vegetables was actually making him sick. So let me back up more, and tell you a little something extra about Bob. Before departing for India the members of our student group were given a list of recommended shots for the program– stuff like Hepatitis, Polio, Typhoid, and Japanese Encephalitis. I had received Hep, Polio, Typhoid and Yellow Fever immunizations for my Africa trips, and not wanting extra needle jabs if I didn’t absolutely need them, I figured I’d be okay without the Japanese Encephalitis. I think it was optional for where we were going anyway. Bob intended to get the Japanese Encephalitis shot, but I think he ran out of time before the program was supposed to begin, so he purchased the vaccine from a pharmacy in the US and brought it on the plane with him from New York to Delhi. His thinking was that once he got to Delhi he would find a nurse, or some other qualified medical technician, who could administer the shot. However the vaccine for Japanese Encephalitis, like I think most vaccines, needs to be kept refrigerated so that the contents of the vaccine don’t spoil (or whatever it is that happens to pharmaceuticals when they are no longer in their proper state). So here Bob is, on a plane, with a white paper pharmacy bag, containing a vial of Japanese Encephalitis vaccine, for about 30 hours. That vial had warmed to room temperature long before we reached the hot and humid streets of mid-August Delhi. After a day or two of orientation, Bob went in search of a medical professional, and carted that same white pharmacy bag around steamy Delhi for another 2 days before he found someone to stick the warm Japanese Encephalitis vaccine in his arm. And surprise, surprise… by evening Bob was laid up in bed sicker than a dog. Pasty and pale, diarrhea and sweating. He was in bed for three or four straight days. Now most of us assumed that Bob was probably suffering from a combination of Delhi Belly and a reaction to the stale Japanese Encephalitis shot that he had been carrying around, un-refrigerated, for days. But not Bob. He was pretty sure his sickness stemmed from eating vegetarian. What could be worse than eating lots of vegetables? Right when Bob started feeling better, his first destination out of his room was to a Subway sandwich shop (yes, they have the American chain Subway in urban India) not too far from our hostel. He ate a sandwich stacked with three different kinds of meat. He felt better later in the evening, and much better the following day. Bob attributed his miraculous recovery to the amazing power of meat. This only reinforced his original idea that he had gotten sick because for a week he was “forced” to eat so many vegetarian dishes. After several vocal comments at dinner last night I pulled [Bob] aside and said that study abroad is about pushing your boundaries and being outside your comfort zone. I told him that he should take this as a learning opportunity about how other people may feel in the United States when roles are reversed. Often times, as a vegetarian, you have fewer meal options, you have to eat something you might not necessarily want, or you might have to do without. It can be very frustrating. I told him that for the first time, many students are able to go to a restaurant here and pick anything they want off of a menu without being worried about what could be in the dish, and that feeling is new and liberating for us. I told him that we don’t want him to “convert” but that we ask that he be more flexible and understand that it might be harder, because it is often harder for us in the US, and it is good to see the reverse side of an issue. Sadly, Bob didn’t take my heart-to-heart truly to heart, and spent a majority of his remaining time in India hunting down US fast food chains like Subway, Pizza Hut, Domino’s, and McDonald’s. When we were stationed in Jaipur for six weeks he would have Domino’s Pizzas delivered to his host family’s house each night–I worry what that family’s impression of American students was after his stay! So the moral of the story is… refrigerate Japanese Encephalitis vaccines and eat more vegetables! It has been really busy at work lately, and I have found myself staying at the office until 8, 9, sometimes even 11 o’clock at night. Maybe if I worked in a big office building, that wouldn’t seem so freaky, but my office is basically inside a 100-plus-year-old house, with all the creeks and cracks that come with it. A few weeks ago, after my 15 hour work marathon my boss was telling me a story about how there used to be a custodian who was in charge of cleaning our office/house, who refused to come and clean unless a member of the office staff was present because he was convinced the house was haunted. Then my boss chuckled. Thanks… I’m happy to hear that story after being alone in the big creaky house at 11 o’clock at night. Then this morning, in one of the “gori wives” facebook groups, a conversation started about being nervous when home alone at night. I admit I am fully in this camp. I was actually quite relieved to hear that many of the other women were also nervous when home alone at night, because for years I thought I was just overly anxious, that maybe I was a bit neurotic for feeling scared. I’m fine when P is home, or if I have guests staying over, but on the rare occasion I find myself completely alone at night I sleep with all the lights on. It’s like every single scary thing I ever thought about comes crawling back. It’s not that I’m afraid of or necessarily believe in ghosts, but it’s just everything—real and imaginary, that starts to flood my mind. Perhaps I just have an overly active imagination. I don’t know. So that reminded me of another story. When I was nearing my undergraduate commencement, I was applying to every international education job posting I could find, regardless of where it was located. My very first professional interview was for a study abroad position at Gettysburg College, in historic Gettysburg, Pennsylvania. For readers who might not be as familiar with Gettysburg, it is famous for being the site of one of the bloodiest battles of the American Civil War with between 46,000-51,000 casualties during the 3 day fight. Today people can go to the town and walk the battlefields, and read different historical markers about different important moments in the fight. The town has kept up a Civil War era (1860s) feel, with a lot of older architecture, antique shops, and people who dress in Civil War era clothing in highly touristic areas—like hotel clerks, waiters, tour guides, etc. Battle casualties were treated in Pennsylvania Hall through about July 29 and totaled nearly 700–many who died in the building and on surrounding property. Soldiers of both armies were treated in Pennsylvania Hall, as control of the College shifted from Union to Confederate forces on the evening of July 1. Pennsylvania College resumed classes on September 24, 1863. Bullets, bones, human remains and bloody books were found in and around the building for many years after the end of the battle. So here I am, already a scaredy-cat, and I was on my way to interview for a job in one of the most haunted towns in America! What was I thinking? I arrived the night before the interview to meet with the director of the office. She had offered to take me out for dinner as an informal “pre-interview,” and we had a nice time. She picked me up at the Gettysburg Best Western Hotel downtown, which, like much of the town, was decorated in a Civil War theme, including hotel clerks who were dressed in bonnets, hoopskirts, and union and confederate uniforms. Who says that?? Really?? Who? I went back up to my room, took out my notes for my presentation the following day, and turned on the tv. This was before I had a cell phone of my own, so I had borrowed P’s, and I took it out and placed it on the table next to the chair I had settled into. For the next two hours I half-watched tv and shuffled through my notes, trying to forget what the director had said. As the tv show I was watching geared up to its conclusion, I started to feel warmth in my chest, like I had just downed a shot of whiskey and a few moments later I thought I saw something moving towards me. You know when you rub your eyes really hard and for the first few seconds afterward everything looks a little fuzzy? Or when you are at a BBQ and you are standing near a hot grill and the air above looks kind of wavy and disturbed. Basically it looked like a wavy disturbed patch of air was moving towards me pretty fast. Between the fuzzy air, my sudden feeling of warmth, and the cheerful reminder of the hotel’s notoriety earlier in the evening, I freaked out. All I grabbed was P’s cell phone and I charged out the door, leaving my key and my shoes, essentially locking myself out in the hallway. I didn’t even wait for the elevator, I ran down the stairs to the lobby, where the hotel clerk in the hoop skirt and bonnet failed to put me at ease. I paced the hallway in my bare feet trying to figure out what to do. I had P’s phone, so I couldn’t call him for comfort. If I called my family, they probably would think I was over reacting, or crazy. So I called my friend Eliza. We had recently returned from studying in India together—I’ve mentioned her before when discussing her art—and I figured after the craziness of India, telling her I was scared of a haunted hotel was probably not that surprising. It was tough to hear her on the other end of the phone. It was senior week back on campus, and students were out enjoying their last few moments of college life. 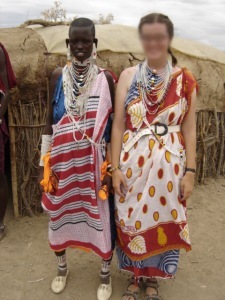 She had met her now-husband a few months before, and I could tell they were out together. But like a true friend, she listened to my fearful babble and helped to calm me down, then reassured me all would be alright. I told her I was ready to spend the night sleeping in the lobby if necessary, but she talked me into going back up stairs and trying to stay in my room a while more. I worked up the courage to ask the front desk attendant for a new key—she probably thought I was crazy anyway—then reluctantly headed back up stairs. As soon as I got up there I turned on all the lights, then I turned the tv volume up, and I got in bed, burying myself under all the blankets so that the only thing visible was the tip of my nose. I spent the rest of the night like that. I didn’t sleep, I just listened to the tv and stayed perfectly still, sweating under the blankets until the sun rose. “A lot of people say it is, if you believe in that sort of thing.” The administrator responded, and launched into several stories about Pennsylvania Hall being the surgical unit during the battle and how some students swear they have seen things around campus. I couldn’t help but wonder if I was offered the job, could I really live there in an apartment, on my own? I had visions of a string of panic and heart attacks. The rest of the interview went well, despite the sleepless night, and later that evening I flew back to upstate New York. A few days later the universe made a decision for me. I wasn’t offered the job. I think it was a good thing. It’s International Education Week again. Is it just me or is this year flying by? If you have read past posts then you know I’m an international educator (international student advisor) at a university in New England. You also know that International Education Week was initiated in 2000, and has been held annually each November (why the State Department frustratingly chose the week before Thanksgiving is anyone’s guess, but that’s when it is always held). Now in its eleventh year, it is celebrated in more than 100 countries worldwide. It is a week which allows communities, such as colleges and universities and other institutions, to celebrate and highlight international and intercultural diversity, and to appreciate the importance of a multicultural environment, particularly for a learning community. Our university celebrates this week through several programs: decorating the campus center with flags representing the (currently) 74 different nations that make up our student body, having student culture groups on campus have special events like our Chinese Student Association’s “Chinese Culture Workshop,” our career development center is having a “Capturing International Experience on your Resume” workshop, our study abroad students have a photo exhibit from various programs abroad, some of our multicultural religious groups are having discussions such as our campus Buddhist group’s “Meditation Workshop,” our dining hall is having an “international food station” with a different regional focus each day this week, and I email out interesting “international ‘fast facts’” to the campus each day. [Pretend I said that super fast in one excited breath]. Sorry, international education gets me a little excited. According to an Institute for International Education Open Doors Report, 723,604 international students studied in the U.S. in academic year 2010/11. I live in Massachusetts and our state currently has 38,698 international students attending higher education institutions. A report calculates that international students and their families have spent a net of $1,389,809,000 in our state economy. To look at the figures for the MA report click HERE. To look up the numbers for your home state click HERE. This week is madness at work… 14 hour days, running here and there, answering question after question, and helping all our new students settle in. Yep– it’s international orientation week! This year we have our largest class ever– roughly 170 international freshmen and about 250 new international graduate students. Now to those of you from giant US state schools, those numbers might sound small, but for an engineering school with only 4,000 total students, and only two full time int’l student advisors, that’s a lot of people to help and keep track of! But the craziness is also really fun, and I’m always excited to meet our new students. So in honor of this I wanted to re-post links to two youtube videos on Culture Shock/Cultural Adjustment that I like to use with our new students. Even though it is geared towards graduate students, I think the presenter does a great job introducing the topic and his own experiences with transitioning to life in the US. Sorry—it seems like the past few days have been “share what C is reading” time on the blog, but I can’t help myself. I also wanted to post it because it discussed one CBP “hotspot” as being upstate New York, my home area, and several of the cases where students and professors have been harassed are around Postam, NY, which is just down the road from my alma mater. I remember seeing several CBP roadblocks set up on “Route 11” (the only “highway” on the western edge of northern New York State) when driving up to my university and back. As an American, I never had a problem, and I think the time or two I might have been stopped with P we had his paperwork. In particular I remember a dark skinned Indian professor from the Global Studies department at my school being bothered by the CBP on several occasions, once he was even carted off to a holding cell while the university scrambled to produce his paperwork. Our Irish friend was traveling with his visiting parents up in New Hampshire over the summer and was stopped at one of CBP’s “roadblocks.” He didn’t have his passport, I-94 card, or I-20 documents on him, and the officer threatened to fine him $500! Luckily he was able to talk his way out of it… had he been of a non-European origin, he might not have fared so well. Ironically—later in the fall he was carrying his passport on him, and it was destroyed accidently by water— he had to apply for a new Irish passport, and go through the visa process again while home in Dublin for Christmas. He nearly missed his return flight due to consulate scheduling conflicts. Damned if you do, damned if you don’t! A Potsdam student was briefly detained last summer while doing turtle research with her professor in a local swamp. “Border Patrol was there asking for documents,” Ms. Parker-Goeke says. “She’s in a swamp—she doesn’t have her documents.” The professor was able to persuade the agents to call the university to clear up the student’s status. 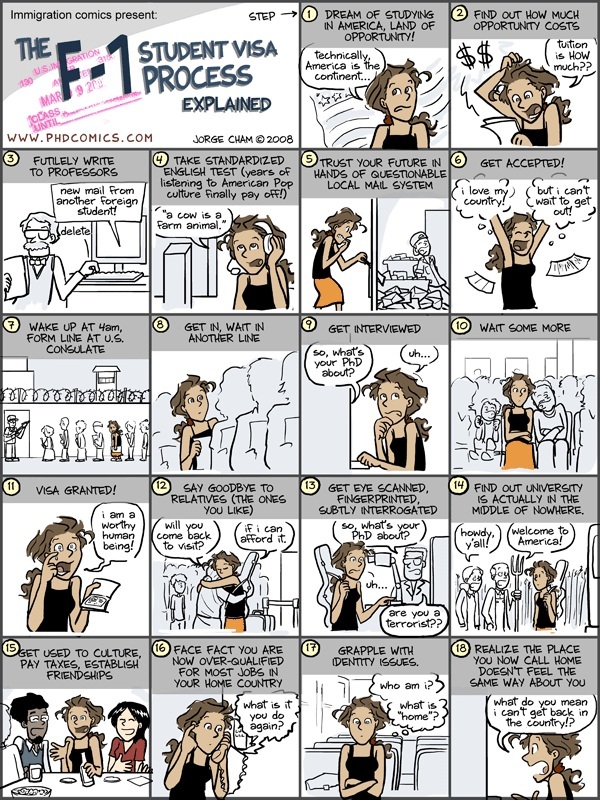 (originally posted January 9, in the online edition of The Chronicle of Higher Education). U.S. Customs and Border Protection officers check passengers' citizenship on a bus in Rochester, N.Y., more than 75 miles from Canada. Some college officials whose students have been stopped believe the customs agency has more resources than it knows what to do with. Six miles north of the University of Maine’s flagship campus, on the only real highway in these parts, students and professors traveling south might encounter a surprise: a roadblock manned by armed Border Patrol agents, backed by drug-sniffing dogs, state policemen, and county sheriff’s deputies. Although the Canadian border is nearly 100 miles behind them—and Bangor, Maine’s second-largest city, just 15 miles ahead—motorists are queried about their citizenship and immigration status. Those who raise an agent’s suspicions are sent to an adjacent weigh station for further questioning and, sometimes, searches. Any foreign students or scholars unable to produce all of their original documentation are detained and could be arrested. Thus far, nobody from the University of Maine has actually been arrested at this ephemeral checkpoint, which usually appears near the start of the academic year, when migrant laborers happen to be leaving eastern Maine’s blueberry fields. One student had to wait at the roadblock until university authorities had satisfied agents that the individual was in the country legally, university officials say. But elsewhere on the northern border, foreign students and scholars experience fear and uncertainty every time they leave campus, pick up a friend at the bus station, or board a domestic train or flight, even when they have all their documents with them. 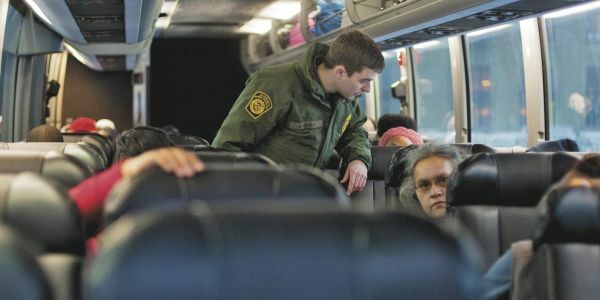 U.S. Customs and Border Protection has greatly increased its manpower along the northern border, allowing for more-frequent use of roving patrols or surprise checkpoints on buses, trains, and highways far from the border itself. Students who failed to carry their original documents have been delayed and fined, apprehended even when they’re just a few miles from campus. For a broad category of students and scholars, even having one’s documents in hand and in order offers no guarantee against being arrested and locked up in a detention facility hundreds of miles away. University officials and immigration attorneys interviewed by The Chronicle told of nearly two dozen incidents in which students or scholars were inappropriately detained at domestic stops by customs officers. Most were in the midst of the lengthy but not uncommon process of changing their immigration status and had followed all the rules. Others were apparently detained because the agents were unaware that while a student’s visa might have expired, his or her permission to study in the country had not. All were in the country legally under the rules set forth by U.S. Citizenship and Immigration Services, which, like Customs and Border Protection, is part of the Department of Homeland Security. Frank A. Novak, an immigration lawyer at Harter Secrest & Emery, a law firm in Rochester, N.Y., says students and scholars typically run afoul of the customs agency when changing status from a nonimmigrant student or work visa (such as F-1, H1B, or O-1) to an immigrant one, perhaps because they have married a U.S. national or been offered a permanent job. They apply before their visa expires and receive permission to work, live, and travel until their application is processed, which may take years. “Inherent in the policy is that your old [nonimmigrant] status will expire,” he says, but customs officers sees this as grounds to arrest them. Officials of several universities located within 100 miles of the Canadian frontier told The Chronicle that their foreign students and faculty have experienced few serious problems as a result of the checkpoints, though they now tell students to carry their original documents with them at all times. The institutions include the University of Maine at Orono, University of Vermont, Wayne State University, Michigan Tech, and Western Washington University. In upstate New York, it’s a different story. For reasons that remain unclear, Customs and Border Protection has had an aggressive presence away from the immediate border, especially around the northern city of Potsdam or in central New York cities like Rochester and Syracuse, which are relatively far from the nearest border crossings. Area residents say Border Patrol officers maintain a near-constant presence at Rochester’s bus station and frequently question passengers at the airport. They regularly board domestic Amtrak trains passing through the area en route from Chicago to New York, where they shine flashlights in sleeping passengers’ faces. A Pakistani undergraduate at the University of Rochester was pulled off a Trailways bus to Albany in 2007, who thought carrying his student photo ID was sufficient for a short domestic trip. Mr. Jensen says the student was held for two weeks at a detention facility before he and his family could appear before a judge and prove they were in the country legally, with an asylum application pending. A University of Rochester doctoral student bound for a conference at Cornell University was taken from a bus and detained for hours at a police station even though he had all his documentation and was in legal status. Mr. Jensen says the Border Patrol agent didn’t understand the student’s paperwork, although it was typical for someone who had changed from a two-year master’s degree to a seven-year doctoral program. “We helped clear it up, but he missed the conference,” Mr. Jensen recalls. It’s unclear why the situation in upstate New York is more serious than in other parts of the country, including areas with high border traffic volumes, like Detroit and northeastern Washington State. Some university officials and immigration lawyers suspect that Customs and Border Protection’s Rochester station has been given more resources than it knows what to do with, reportedly expanding from seven to 27 agents since May 2008. There are no ports of entry in its jurisdiction, which lacks a land boundary with Canada. “Basically they have nothing to do, so they’ve come up with a really easy way to arrest a lot of people through internal enforcement,” says Nancy Morawetz, of the New York University School of Law, who has represented individuals caught up in the sweeps and procured arrest information from Customs and Border Protection via the Freedom of Information Act. The records have shown that less than 1 percent of those arrested on buses and trains in the Rochester area had entered the country within the past three days, and that none of them could be shown to have entered from Canada, she says. “I think that data is incredibly powerful,” Ms. Morawetz says, “because it shows that all this aggravation and hardship has essentially nothing to do with the Border Patrol mission” of securing the border. Customs and Border Protection headquarters did not make anyone available to discuss the programmatic purpose of the sweeps and checkpoints, and its written statement said only that it “performed in direct support of immediate border-enforcement efforts and as a means of preventing smuggling organizations from exploiting existing transportation hubs to travel to the interior of the United States.” An official who could speak for the situation in upstate New York did not keep a scheduled telephone interview. Some near-border institutions refused to discuss the effects of highway stops and roving patrols on their foreign students. The Swanton office of Customs and Border Protection occasionally sets up roadblocks on Interstate 91 in White River Junction, Vt., a few miles from Dartmouth College’s campus, but a spokesperson for the college, Sarah A. Memmi, said it would not “contribute to your story.” Similarly, officials at the international office of the University of North Dakota said the institution did not wish to comment on the situation in its region. International Education Week… Back Again! As my regular readers know, in my non-blogging life I am an international student advisor at a school in New England. So I can’t let International Education Week slip by without giving it a shout out, like last year. It’s also why I took a blogging hiatus last week– between IEW prep, an international educators conference, the end of Tihar and the unbelievably quick (soon-to-be) arrival of Thanksgiving, stuff just got piled up! International Education Week was initiated in 2000, and has been held annually each November. Now in its eleventh year, it is celebrated in more than 100 countries worldwide. It is a week which allows communities, such as colleges and universities, to celebrate and highlight international and intercultural diversity, and to appreciate the importance of a multicultural environment, particularly for a learning community. 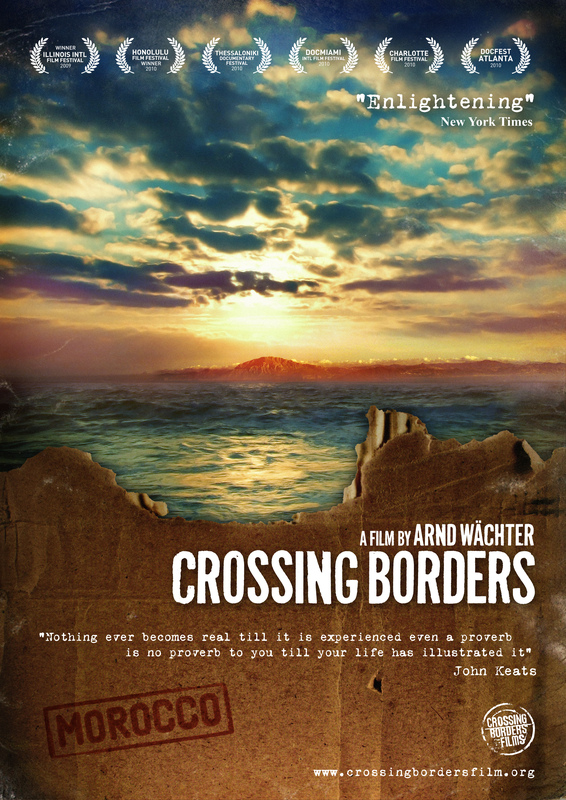 …a feature documentary that follows four Moroccan and four American university students as they travel together through Morocco and, in the process of discovering “The Other,” discover themselves. I met the director at the international educators conference last week, and was able to secure a copy of the award-winning film. Woo-hoo! To watch the trailer click HERE. 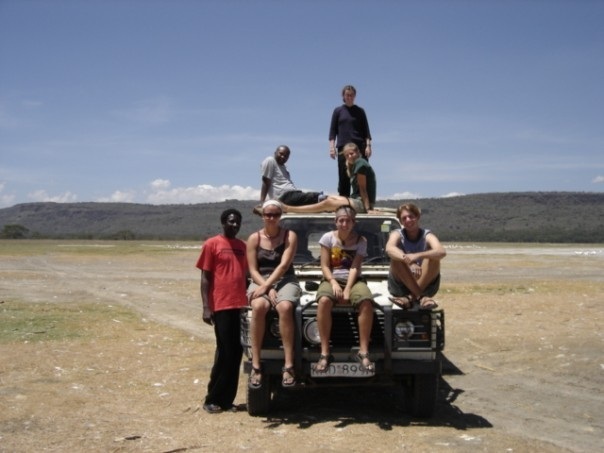 My semester in Kenya as an undergraduate was one of my favorite times abroad... that's me standing on top of the landrover with some of my classmates and one of my favorite professors of all time (in red) while on safari in Lake Nakuru National Park, Kenya. The article is called “Why the Brain Doubts a Foreign Accent,” and is a brief discussion of a few short experiments created to try and reason out why native speakers of a language have little patience with, or tend not to listen well, to a foreign accent. I thought the readership of this blog might find it interesting, so in turn I wanted to pass it on to you! Happy Friday.